Aztec Treasure takes place in the 16th century and depicts the era of the Aztec people in Mexico. 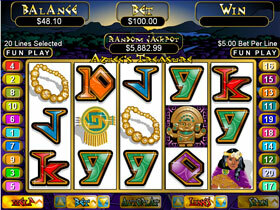 It is a video slot game consisting of 5 reels and 20 paylines, and high quality graphics. 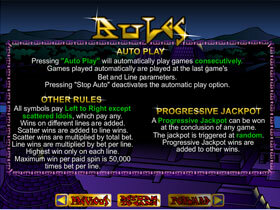 Players can wager a maximum of 20 coins per spin. The common winning combinations and icons consist mainly of Aces, Kings, Queens, Jacks, Tens and Nines. Other winning icons are depicted with Aztec Attire, a Jaguar, a Gold Necklace and a Coin. The prominent symbols in this game are the Aztec King, an Idol, an Aztec Lady, a Jaguar, an Aztec Warrior, a necklace and a coin. The Wild icon is depicted by the Aztec King, which substitutes all other icons except for the Golden Idol icon, which is the Scatter. The Scatter icon will trigger the Free Spins Round and a further Free Spins feature will be triggered in the main Free Spins game. 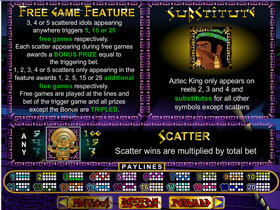 When the Aztec King creates a winning combination, there will be a bit of animation, and sound effects will be audible in the Free Spins feature. Aztec Treasure contains a Progressive Jackpot which will randomly be triggered with any sized wager and there is no need for a particular winning combination on any payline.